It's classy, elegant and fun to wear. This watch has a titanium case and bezel, which surround a black face. The silver hands and hour markers look sharp against the black dial. The day and date are displayed in the 3 position, and highlighted by a silver box. Because it's mostly titanium, this watch is super light. It's possible to forget you are wearing it. The quartz movement makes sure the time is always correct. Water resistance is rated to 50 meters (165 feet). 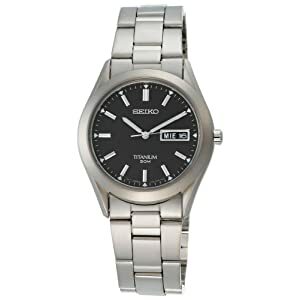 This is a nice choice for a watch that looks good with business or casual clothes.